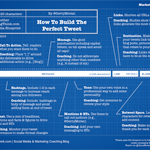 MarketingThink.com produced another social media blueprint infographic called “How To Build The Perfect Tweet”. Writing an effective tweet with limited characters is important in assisting the three most important social media goals: amplify, engage, and convert. So take a look at this blueprint to understand anatomy of the perfect tweet.